It would be the biggest bird in the history of aviation. 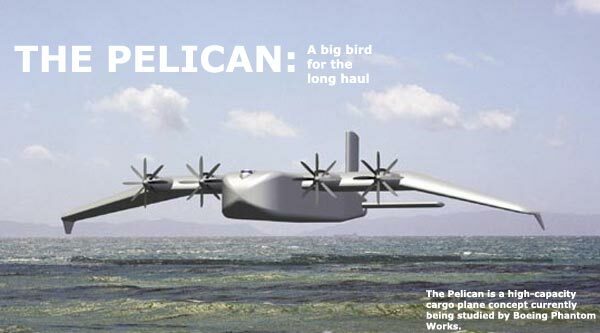 Dwarfing all previous flying giants, the Pelican, a high-capacity cargo plane concept currently being studied by Boeing Phantom Works, would stretch more than the length of a U.S. football field and have a wingspan of 500 feet and a wing area of more than an acre. It would have almost twice the external dimensions of the world's current largest aircraft, the Russian An225, and could transport five times its payload, up to 1,400 tons of cargo. Designed primarily for long-range, transoceanic transport, the Pelican would fly as low as 20 feet above the sea, taking advantage of an aerodynamic phenomenon that reduces drag and fuel burn. Over land, it would fly at altitudes of 20,000 feet or higher. Operating only from ordinary paved runways, the Pelican would use 38 fuselage-mounted landing gears with a total of 76 tires to distribute its weight. The military, commercial and even space prospects for such a cargo planeofficially known as the Pelican Ultra Large Transport Aircraft, or ULTRAare also huge. When could the Pelican be flying? The answer may lie in the Army's Advanced Mobility Concepts Study, scheduled for release next April. The Pelican has been offered by Boeing as part of a system-of-systems solution that would include the C-17 Globemaster III transport, the CH-47 Chinook helicopter and the Advanced Theater Transport. "A favorable report would set the stage for a possible codevelopment effort between Boeing, the U.S. military and interested commercial cargo carriers," Skorupa said.